Transition to fatherhood is marked by adaptive changes in the brain and biological responses which may influence role transition to parenthood, paternal-infant interaction, and neurodevelopmental outcomes of the late preterm infant (LPI). We completed a critical and narrative review through searching five electronic databases—Medline, Embase, Cochrane Central Register of Controlled Trials, PsycINFO, and CINAHL. Six studies provide insight on the father’s influence on neurodevelopment of LPIs, father-infant interaction, and paternal emotional distress. The literature though limited explains that fathers react and respond differently to LPIs when compared to mothers. Fathers feel they are in the periphery of maternal, newborn, and child health care and have unique needs and require different resources to cope. 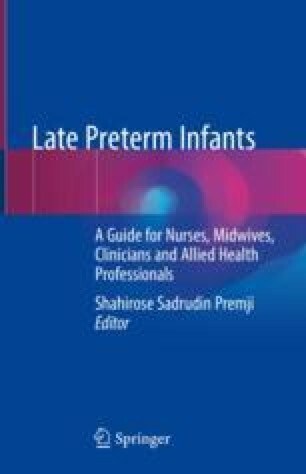 There is potential opportunity to improve neurodevelopmental outcomes of LPIs and exclusive breastfeeding through paternal caregiving environments that provide opportunities in the postpartum period for fathers to practice skin-to-skin contact and have reciprocal vocalizations or conversations with their LPI in sensitive and responsive ways. Consequently, fathers need to integrate in the provision of care to the newborn with emphasis on paternal, newborn, and child care.